It was while riding our big, air-conditioned tour bus up the Meander River valley, to view the ruins of Laodicea, that I began to appreciate what Paul and the first Christian evangelists in the Roman province of Asia had to endure for the sake of the gospel. I was travelling through what is now called western Turkey. I was the lone Canadian on a packed, two-week tour of biblical and related archeological sites this past June. The tour took us from one side of the Aegean to the other, from Miletus in Turkey via Istanbul to Corinth in Greece. It was hot every day, with the temperature rising into the mid to high 30s Celsius. It was tiring – days often punctuated with long walks to and through the sites we visited, climbing and descending steep marble steps of uneven height, worn smooth by the passing of thousands of feet over the centuries. And always, it seemed, there was one more stop before we reached our hotel for the night, physically drained and footsore. Or at least I was. The rest of the group were all from Texas. They seemed a lot better acclimatized to the heat than I was – despite being, for the most part, older than me. But even they had their limits. But for all the discomforts, there was always the welcome sight of our tour bus, our oasis, where we could relax and recover, tossing back bottles of chilled water from a cooler that our driver kept fully stocked. And at the end of the day, there awaited us an air-conditioned room, a refreshing shower and change of clothes and (for the most part) an enjoyable evening meal. And even when there was something to complain about, we could always remind ourselves we’d soon be back home. Of course, I didn’t have to travel in Turkey and Greece to know that the journeys of Paul and his companions would have been a lot more arduous than anything I could ever experience 20 centuries later. But it certainly drove that head-knowledge home. By bus, the journey from Kusadasi (on the Aegean coast near Ephesus) to Laodicea took close to three hours, including one rest-stop. By foot, it would have taken maybe 10 days, according to our excellent Turkish tour guide. And even if their reputations as trouble-makers and heretics and worse had not gone ahead of them, I’m sure these evangelists incurred the wrath of many as they travelled, as they undoubtedly sought to take every opportunity to tell someone the good news of Jesus Christ. Those early Christians also rejected the growing demands by the Roman emperors of the day to be worshipped as gods; after all, “Jesus is Lord” (Romans 10:9), not Caesar. There was no desire for compromise or concession on either side, and none was even considered. It’s no coincidence that the emperor Domitian, who ruled near the end of the first century, was the first to demand that he be worshipped as divine – and at the same time launched the first full-blown persecution of Christians. But how could the Christians do anything less than stand firm, given the fraudulent religious practices going on all around them? At Hierapolis is a cave next to and below the temple of Apollo that emits carbon dioxide. Over it used to stand the Gates of Hades, because it was believed that this was an entrance to the underworld, where the god Hades lived. Putting an ear inside the cavity where the gas came out, we could hear it hissing faintly still. Although the room would have been fatal to enter, the priests of Apollo had figured out how to go in and come out alive. (Maybe they just became good at holding their breath for long periods.) Amazed onlookers believed this proved they were superior beings. For a fee, people could ask questions of the oracle of Hades. It is not hard to imagine Christians sharply repudiating such practices as cynical and foolish. Given this unbridgeable gap, it’s no surprise that these faithful few Christians provoked derision and loathing everywhere they went, especially as they began winning converts. Nor is it surprising that when Paul first arrived in Corinth, a city whose religious practices even by Roman standards were considered immoral, he said he came “in fear and with much trembling.” To the enemies of the gospel, he noted, “We have become, and still are, the scum of the world, the refuse of all things” (1 Corinthians 2:3; 4:13). Nowhere is this opposition more dramatically represented to this day than in the 25,000-seat theatre at Ephesus. It was quite the sensation to stand in this vast space where the silversmiths frenziedly declared their loyalty to Artemis, their city’s patron goddess, now under threat from these Christians (Acts 19:21-41). Thanks to the intervention of his Ephesian friends, Paul was not hurt in the riot. But at other times, as he ‘boasted’ to the church in Corinth, he had been beaten countless times and often nearly killed; had been stoned, lashed, shipwrecked and lost at sea; had been in constant danger from all sides; had known hunger, thirst and many sleepless nights – all in addition to his ceaseless “anxiety for all the churches” (2 Corinthians 11: 23-28). Paul understood it was only by God’s grace that he had the strength to endure such terrible, relentless torture (2 Corinthians 12:9-10). But the same could not be said for many of his followers. As he remarked sadly near the close of his ministry, “all who are in Asia” had deserted him (2 Timothy 1:15). He may have felt most keenly the demise of the church in Laodicea. Of all the sites we visited, that one remains for me the most meaningful. I really did not expect to see much of anything. 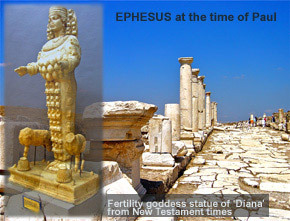 In fact, most of what we saw of Laodicea had been excavated within just the past decade. As the Spirit said in Revelation 3:14-22, it was a city of great wealth – a fact confirmed by the breadth of the main street we walked down, by the elegant, re-erected marble columns we saw, and by the fact it had not one theatre, but two. Located at the intersection of two major trade routes, Laodicea was the most important financial centre in all of Phrygia. It was famous for the manufacture of popular garments woven from a soft, glossy black wool that was unique to the region. And it boasted a renowned medical school. The Laodiceans were proud of their prosperity – so proud that when their city was destroyed in an earthquake in AD 61, they declined an offer of financial aid from the emperor Nero, claiming they needed no one’s help to rebuild their city. In the one theatre we visited, we saw first-hand the destruction caused by a later earthquake. This pride in their self-sufficiency ran so deep that it ultimately choked the life out of the church in Laodicea. The appalling implication of Revelation 3:20 (“I stand at the door and knock”) is that they had even banished Christ from their midst. Indeed, of the seven churches of Revelation, Laodicea is the only one about which the Spirit had nothing positive to say. He could only urge it to “be zealous and repent” (3:19). Standing on the hill where Laodicea once stood also made clear what the Spirit meant when he denounced the church’s works as being “neither hot nor cold” but instead “lukewarm” (3:15-16). Laodicea’s biggest problem was its water supply. Hierapolis, six kilometres to the north across the Lycus River valley, was (and is) famous for its natural hot springs laden with calcium carbonate. The long white cliff formed by centuries of deposits from these springs, which we also visited, was clearly visible from Laodicea. Colossae, 10 kilometres to the west and so far unexcavated, was just as well known for its cold springs. In between lay Laodicea, which depended on an aqueduct and underground pipes for its water supply – pipes that, as we saw, became completely clogged from the impurities in the water. It must have been virtually undrinkable. The symbolism of these verses is clear: hot and cold water are both beneficial in their own ways, but lukewarm water is not good for anything. Obviously, the same can be said for lukewarm Christians. The contrast could not be more stark. On the one hand, our tour gave visual context to the fierce opposition that these early evangelists brought on themselves by preaching Christ to people with a vested interest in defending their own religions – and yet they persevered despite terrible suffering. And on the other, we saw the ruins of Laodicea, which serve as a lasting monument to a beautiful, prosperous city so steeped in pride and complacency that even the church in its midst was ultimately incapable of standing against it. It’s not hard to draw parallels between Laodicea and Metro Vancouver, where I live. Both are alike in many ways, including being earthquake-prone. And what of the churches? Who do we in our comfortable modern communities most resemble – the inward-looking, self-satisfied church of the Laodiceans or the passionate, all-enduring, Christ-focused, Spirit-empowered evangelists of first-century Asia? All I can say is I know which camp I’d rather be in.